Principal Cast : Nick Offerman, Rashida Jones, Paul Giamatti, Eddie Spears, David Boar, Sean Kenin, Raquel Antonia, Daniel Hagen. Synopsis: Based on the timeless novel by Jack London. A loyal wolfdog’s curiosity leads him on the adventure of a lifetime while serving a series of three distinctly different masters. Jack London’s venerable tale of a loyal wolf in the Yukon landscape has, like literary contemporaries Sherlock Holmes and Frankenstein, been turned into a big-screen adventure almost continuously since the author’s original publication of the original story back in 1906. The story of a wolf cub who grows to be owned by a trio of disparate masters, one of which isn’t particularly benevolent, is most recently for Western audiences memorable for the Ethan Hawke version in 1991, and a couple of short-lived television series a year or two later. 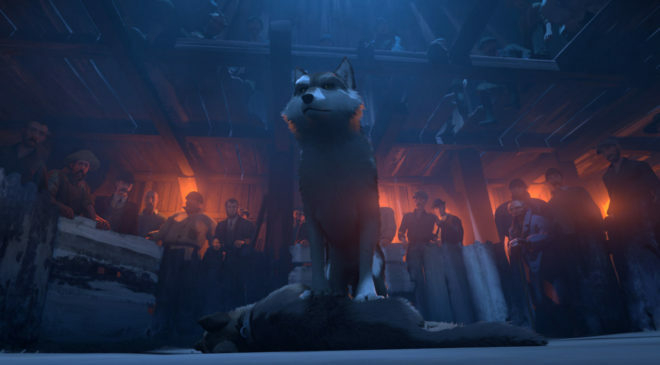 Since then, Hollywood has largely abandoned White Fang as a narrative, with its wilderness-set fable of ownership, cruelty and redemption perhaps not quite as commercially viable a property as a live-action film these days: bless the French, however, for director Alexandre Espigares’ CG-animated take on the story (titled Croc-Blanc in other markets) is a lavish, lovingly designed adventure that will make animation purists sit up and take note, with glorious textures and character design work, and a sense of epic scale for this dogs-eye-view take on our world. The Gold Rush of Canda’s Klondike, in the 1890’s: a young wolf pup is born in the wilderness, and survives until being rescued by a local Native American, Grey Beaver (Eddie Spears), who trains the pup – now named White Fang – as a sled dog for his fur trade. One day, after being robbed following the sale of a bag of pelts in town, Grey Beaver is forced to give up White Fang to pay for food for his tribe, and the wolf lands in the cruel protection of evil dog-fighting ringleader Beauty Smith (Paul Giamatti). After time beating other local fighting dogs, White Fang is eventually rescued by gold-hunter and former lawman Weedon Scott (Nick Offerman), who, along with his pregnant wife Maggie (Rashida Jones) are trying to make their living up in the wilderness. Scott, however, hasn’t counted on the wiliness and deviousness of Beauty’s desire to keep White Fang for himself. White Fang serves as Jack London’s sister story to his more popular Call Of The Wild, which itself has been turned into several feature films, and which also displays hounds within the peaked Canadian wilderness and their dynamic relationship with their human masters. 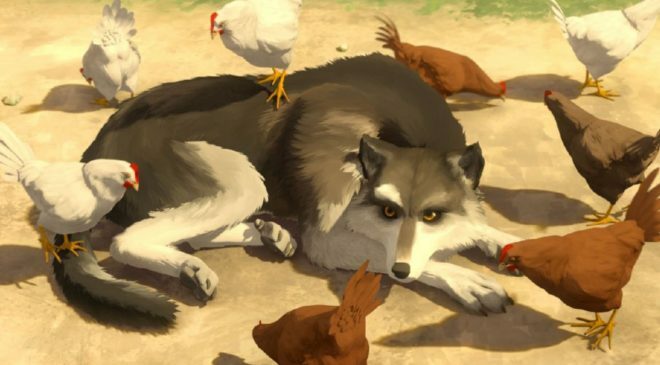 White Fang, at least in its 2018 animated form, return the story to its central perspective of the titular wolf, rather than a sanitised Disney-style human drama with dogs as sidebars. Espirages’ animation here is – and I cannot stress this enough – stunningly beautiful, like moving oil-paintings come to life on screen, and although the story itself feels too uneven to remain popular among its target demographic of kids, there’s a simplicity and stateliness to White Fang that will draw gasps from animation fans across the globe. A luxurious widescreen style simply enhances the gorgeous landscapes and animal animation on display here, and the film does veer away from depicting the starker moments of violence in London’s original book: a lot of the story’s harder elements occur off-screen, and the film is almost entirely bloodless even when logic dictates it ought not to be, so as a “family friendly” watch there’s definitely merit in sitting down with the kids for this one. 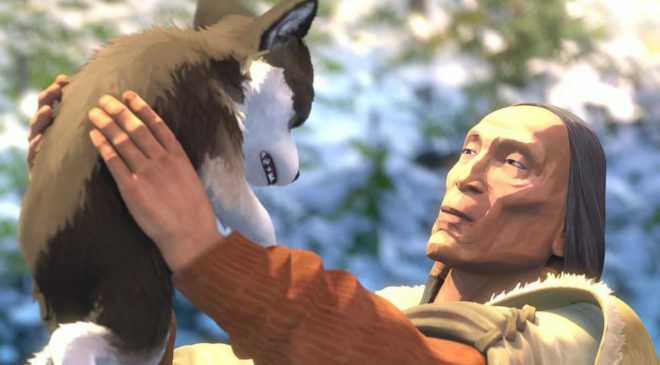 Thematically, however, White Fang might cause younger children to become distressed and/or ask difficult questions, and since it’s told from the point of view of White Fang himself, the answers aren’t presented here. A lot of the early going in White Fang is old-style silent animation: that is, when the film depicts White Fang’s birth and puppyhood, there are entire minutes without the sound of a human voice. The wolves and dogs in this film aren’t anthropomorphised at all (something my daughter was particularly annoyed with, because she kept waiting for the dogs to talk!) and patience will lead to a more fulfilling viewing than young children might be expected to partake, but as pure a story as London’s original narrative is, Espigares’ and his team of animation artisans cannot muster a narrative or emotional center to match the visuals. The film isn’t inert, nor is it a flaccid take, but due to its episodic nature it does feel a little clumsily joined together. Not for lack of trying, however, and the English voice cast is really very good here. Led by the likes of Paul Giamatti as the horrifyingly malicious Beauty Smith, Eddie Spears as Grey Beaver, and an out-of-place Nick Offerman as “nice guy” Weedon Scott, White Fang’s vocal talents are layered in wonderfully to the gloriously painted animation, which looks nothing like that you’d find in a Pixar or Dreamworks “blockbuster”. In truth, the animation in White Fang does take some getting used to, mainly because it’s so totally different from the staple far we’re used to on screen these days, and it’s a refreshing change for the better. 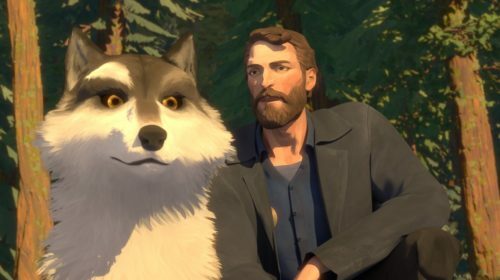 Terrific animal animation, some dynamic action sequences, and glorious Canadian landscapes make for breathtaking, occasionally miraculous viewing on a decent screen (sadly, White Fang will never make it to the big screen here in Australia, at least not that I saw anyway) but for those with decent home setups you’ll be more than satisfied. 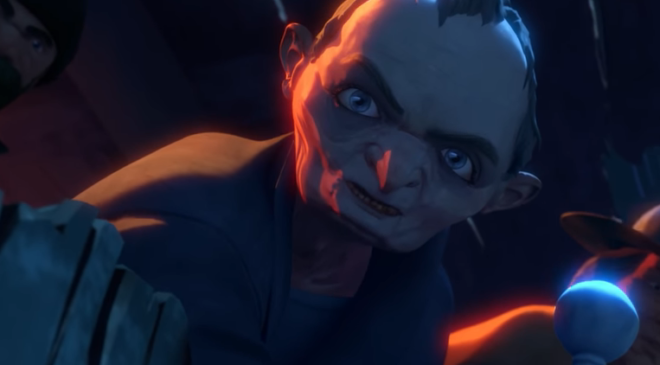 The film’s score is by French-born composer Bruno Coulais, known for his work on Henry Selick’s Coraline, and as a musical accompaniment it’s a marvellous thing indeed, ebbing and flowing and occasionally tipping into “you simply must feel something in this scene” overbearing, but altogether sublime. Technically the film looks and sounds ridiculously good, from the subtle crackle of Grey Beaver’s campfire to the harsh slap of Beauty Smith’s cane on wood, not to mention the intricate and glorious sounds of the wolves within the film itself, everything about White Fang’s sound design propels the narrative and draws the viewer deeper into the world it presents. That’s not to say White Fang isn’t without fault. 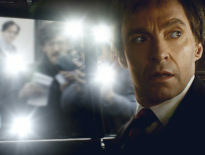 The film’s attempt to please both younger and older viewers leads to that bizarre grey area of indifference to both, where the film will probably satisfy neither. Younger kids will wriggle through prolonged moments of inaction and animated wonderment, while adults will find the sanitised violence, obvious removal of true harsh wilderness life limits the scope and power of the story’s ability to work properly. 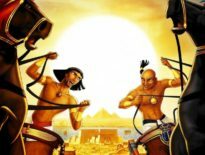 I found the film engaging and enjoyable myself, although I could see my kids struggling with a lack of on-screen explanation as to the themes and historically accurate actions of the participants in the story. I’m not asking a film to treat me like an idiot, but if you’re making a film aimed at kids you might want to contextualise a bit of what they see so they can understand motivations later in the story. White Fang is a work of visual art hamstrung by a story ill-prepared to hone in on the core themes of London’s original text. The filmmakers have taken some liberties with the story to bring it to a younger audience, some of which work better than others (the addition of Rashida Jones’ Mrs Scott, who isn’t in London’s novel, seems inserted to counterbalance an almost entirely male-dominated affair, and in truth it’s nowhere near as effective as the stuff the filmmakers didn’t make up) but the overall achievement in animation often supersedes any failings of the story or characters within it. 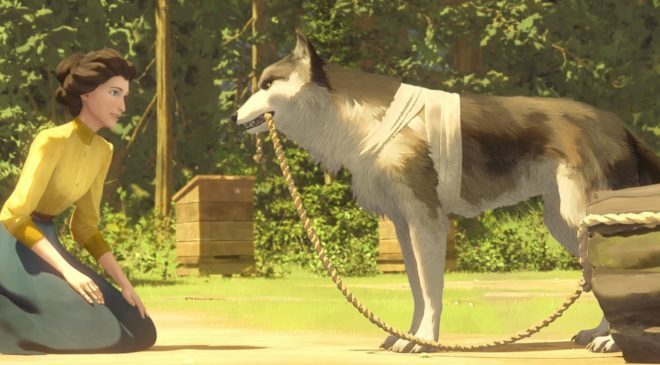 White Fang is one of the most beautiful animated films I’ve seen in quite a while (up there with The Red Turtle for being so utterly anti-Disney it turned my head!) and the story, while definitely more saccharine than I expected, will keep younger audiences entertained so long as they’re good to think for themselves during a movie. Worth a look for the animation alone.